Claude Monet was the leader of one of the 19th century's most visually different artistic movements, Impressionism, which concentrated on how light and color were perceived by the artist. For Monet and other Impressionists like him, the realistic and detailed look of a scene wasn't as important as this vibrantly new depiction of light and color. Unlike Realism before it, the Impressionists were unconcerned with their work being the basis for political and social commentary and their art saw a return to aestheticism to a degree. Similar to Realism though, such a revolution in style and presentation brought with it early rejection and scorn but Monet and his Impressionist circle remained firm in their endeavors. At the peak of Monet's career Impressionism was being ushered into the mainstream art world and as the leader of the movement Monet had insured his legacy long after his death. The artist's personal life was considerably more turbulent than his professional life and despite becoming a renowned and accepted artistic genius of his era, he suffered many personal hardships. These include the death of two of his wives, which had a profound effect on his artistic outlook as well as his own health. Monet's life and career spanned two centuries and his art continued through mechanical, political and war-faring revolutions. Monet and his family relocated to London due to the Franco-Prussian War in 1870. Previous movement around Europe aided the development of his painting style and this particular move was no different. 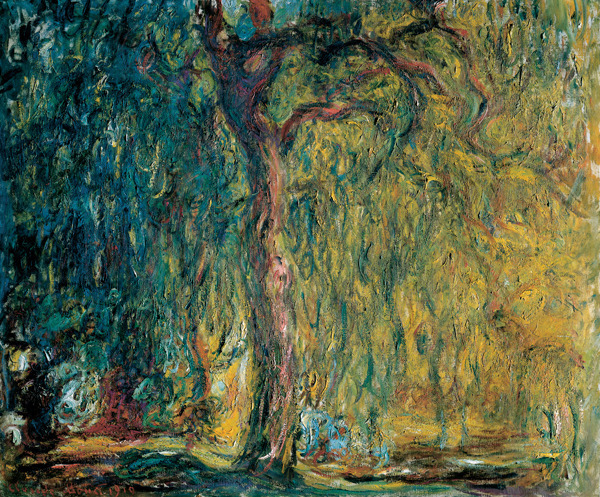 The First World War in 1914, in which his younger son Michel served also proved to be inspirational with Monet painting a series of weeping willow trees in respect of the soldiers that had fallen during the war. In response to Impression, Sunrise art critic Louise Leroy said that the work seemed unfinished and like an "impression". The comment, which was intended to disparage was used by the Impressionist as a name for their movement. 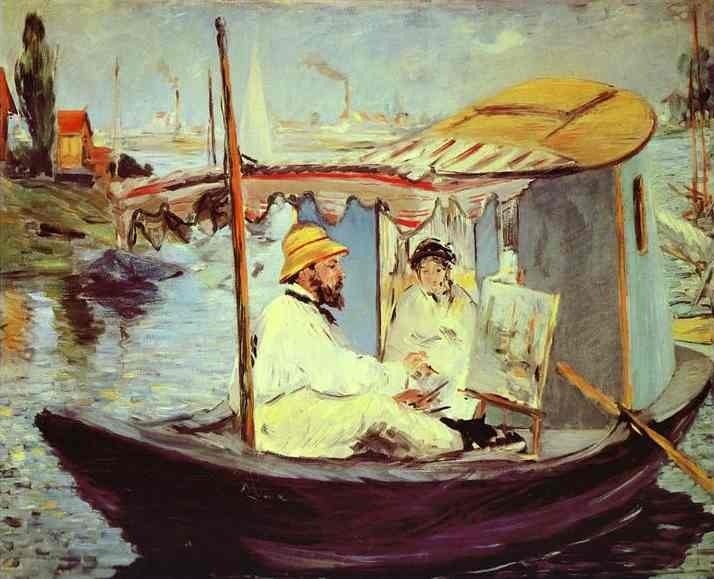 Claude Monet, or Oscar Monet as he was christened, was born on the 14th November 1840 in Paris. He attended Le Havre secondary school of the arts where he made a name for himself selling charcoal caricatures. Monet's love of art and determination to be an artist was compounded by his continued schooling by renowned names in art history. He continued his artistic education by taking lessons from Jacques-Francois Ochard, who himself was a student of Jacques-Louis David. Monet also studied under the tutelage of Eugéne Boudin, who introduced him to painting with oil paints and shared with him his style of "en plein air" or 'outside' style of painting. Monet's focus brought with it his first taste of artistic recognition as he went on to paint his future wife Camille Doncieux, in 1866. 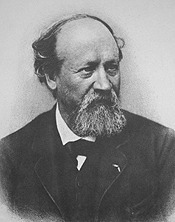 The pair would later welcome their first son, Jean, and later married. Monet and his family relocated to London for a while due to the outbreak of the Franco-Prussian war in 1870 and it was here that he was exposed to the landscape work of John Constable and Joseph Mallord William Turner. The family moved around substantially after London, staying in Zaandam and Amsterdam in the Netherlands. Monet also relocated to the village of Argenteuil in France for a brief time. In 1872 he settled back in France and painted perhaps one of his first true Impressionist paintings, Impression, Sunrise. This work was the centrepiece of the first Impressionist exhibition in Musée Marmottan Monet, in Paris. Now considered one of the foremost authorities and leader of the Impressionist movement, Monet made an important move to a house in Giverny, Upper Normandy. 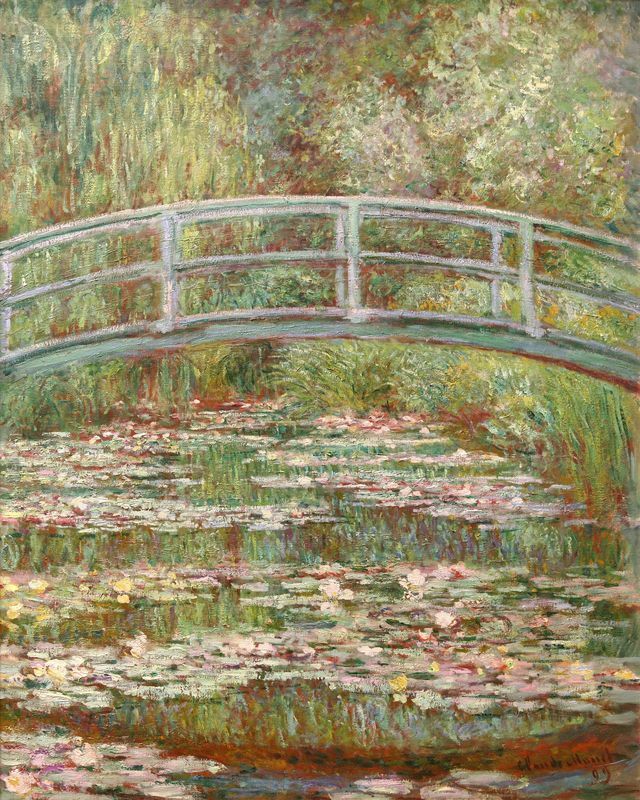 There he began painting his now famous water garden and the inspiration for perhaps another of his most renowned works. Monet's intent was to paint a series of paintings, the main purpose of which was to depict various natural scenes in different light conditions. However, the artist's ailing health and increasingly bad eyesight were evident in his work. Monet began suffering from cataracts and in 1923 had two operations to remove them. Before then, though, his work in response to the First World War including a series of weeping willow trees had a reddish tone not uncommon to that of cataract sufferers. 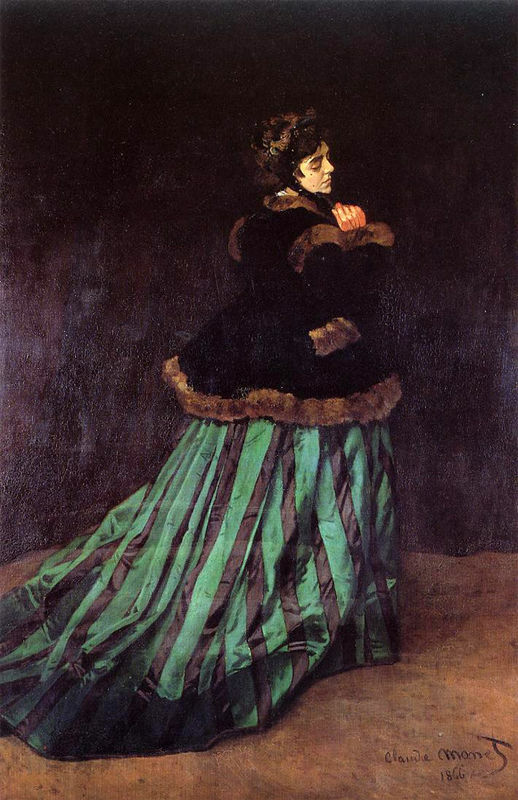 Monet died of lung cancer on December 5th 1926 at the age of 86. His final resting place is the Giverny church cemetery. Monet and other Impressionists sought to paint and depict life in a style that was unlike anything that preceded it, where color and light were most important. Despite not being a traditionally Impressionist painting, Monet's love of natural light can be seen in both of his earliest recognized works. 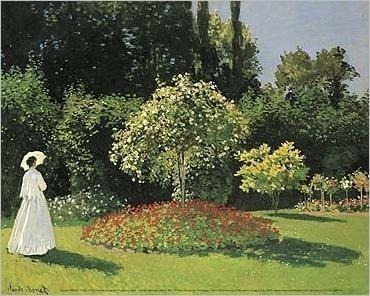 The low-lit dark tones of Woman in the Green Dress and the natural summer sunlight of The Woman in the Garden are a perfect display of Monet's early palette range. Monet's brush stroke is a key feature of his works. The technique, honed throughout his career, relies on fast brush strokes in order to depict light in never before seen Realism. 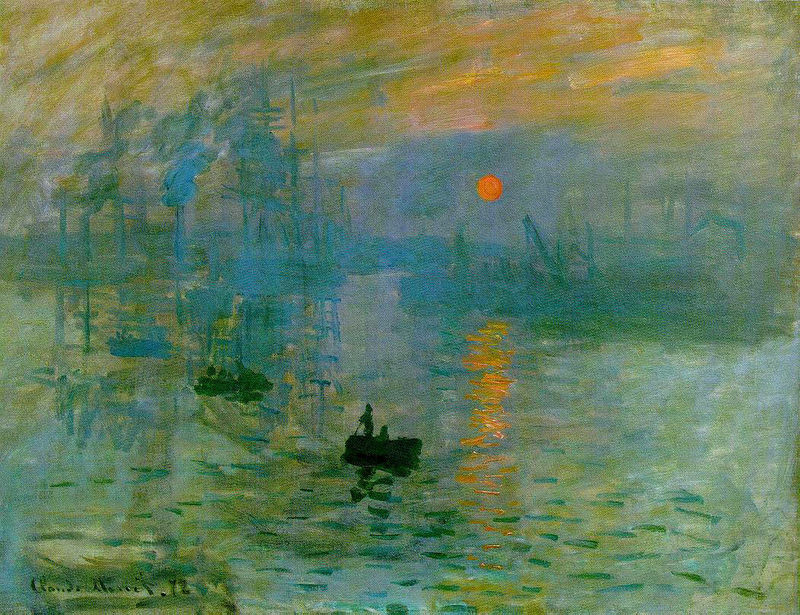 In Impression, Sunrise Monet's Impressionist brush stroke can be seen in full effect. The piece itself is a painting of the port at Le Havre in France and Monet's rapid strokes are used to portray the setting suns' reflective power on the gentle darkened sea. The only tangible, solidly painted form in the work is the vibrantly orange sun and everything else gains or loses consistency depending on its distance from this ray of light. Monet's use of color towards the end of his career is said to have changed significantly due to his ailing health. 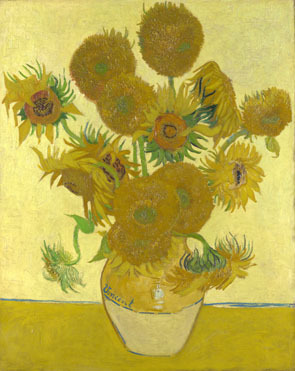 The artist famously suffered from cataracts but continued to paint before and after he had them removed. Due to this his work, primarily in regards the palette used for a number of pieces, changed. Before the cataracts removal many of his works had a reddish hue that is said to be indicative of people suffering from the condition. Monet's style of Impressionism was settled over his formative years and it was during this period that several figures and artistic elements had the biggest impact on his style. Unlike most artists, Monet attended very few prestigious schools, instead refining and honing his style when coming into contact with great artists who he both learnt from and collaborated with. 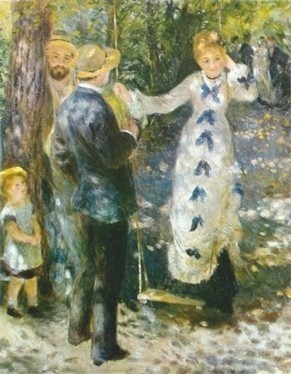 Amongst these were fellow Impressionist figures, such as Pierre Auguste Renoir. In his early days he learnt some of the basics in the formation of his style from figures such as Jacques-Rancois Ochard and Eugéne Boudin. At its root, Impressionism seemed to take its cue from the basics of the art movement that preceded it. 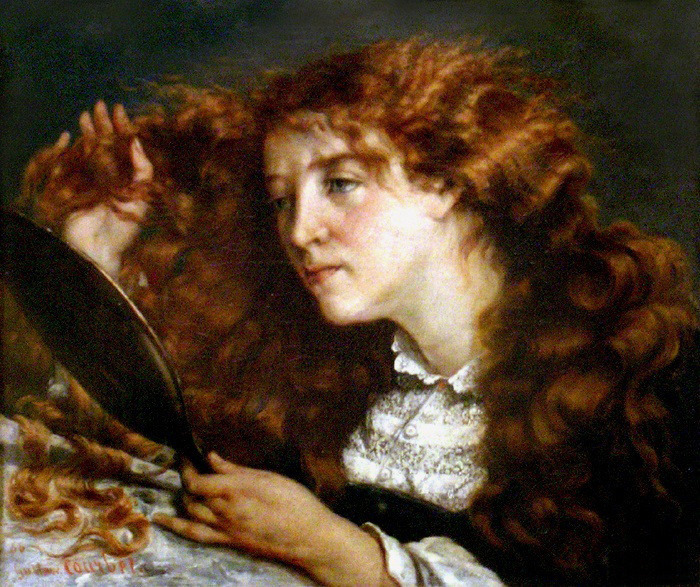 Realism and its founder and leader Gustave Courbet sought to depict ordinary scenes in the world. They didn't believe that a person had to be rich or noble in order to warrant depiction through painting. Impressionism believed in the same basic ideals and despite the look of the movements being noticeably different, Realism paved the way for what Impressionism sought to later achieve. Landscape legend Eugéne Boudin had a significant impact on Monet's early career and taught the Impressionist leader one of the most important styles of painting: En plein air. 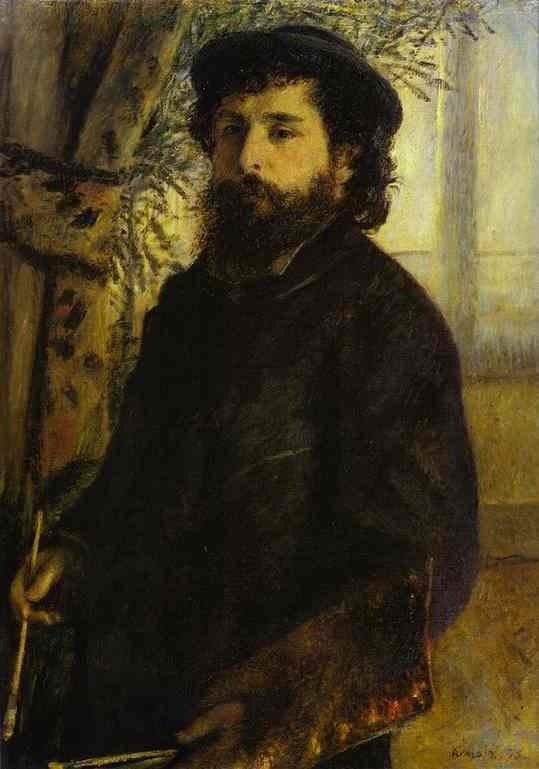 Boudin himself was heralded by legendary literary figure Baudelaire as 'the master of the sky' in response to his works and was the recipient of a eulogy from the famous poet. Boudin, who was born in France, owned a shop in Le Havre, where Monet spent most of his formative years. Here Monet readily adopted both the use of oil paints and the style of 'En plein air', or painting outdoors as it is translated from French. This style of painting is exactly how its name denotes, with the painter painting outside shielded from the light by an umbrella in order to paint the motif there and then. Throughout Monet's career he came into contact with future Impressionist figures that would solidify his belief in the tenants of the Impressionist style. 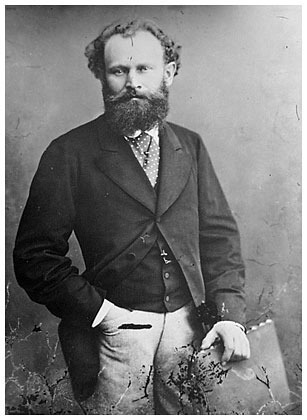 Upon traveling to Paris and visiting the Louvre, Monet met some of these figures and amongst them was Édouard Manet. It was when Monet returned from the army however that he was influenced most by the thoughts of his contemporaries. 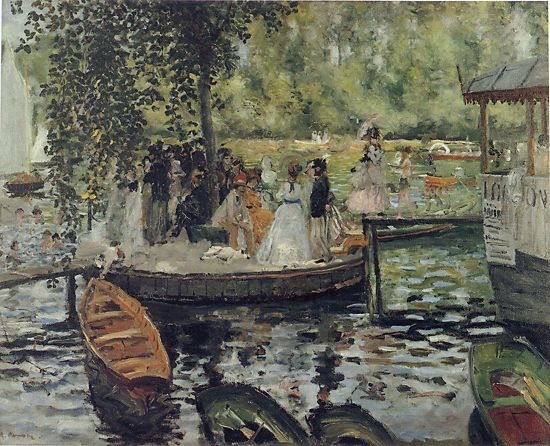 The group of future Impressionists at the time comprised of the aforementioned Pierre Auguste Renoir, Frédéric Bazille and Alfred Sisley and they all shared their burgeoning ideas about the visual effect of light en plein air. Scene of the Houses of Parliament on a foggy day. Scene of the Houses of Parliament. Scene of the Houses of Parliament with sunlight. Landscape scene of the harbor at Le Havre. The artists son playing with his toy. Landscape scene of the artist's water lily garden. A scene of poplar trees in the autumn. A scene from the artists water lily garden. As the leader of a movement which rose to meteoric fame in the 19th and the beginning of the 20th century, Monet had a litany of followers. Both contemporary and modern day critics share the view that amongst the Impressionists Claude Monet was the one who was constantly innovating and had an eye for new techniques that the other Impressionists seemed to lack. Despite receiving harsh criticism during his lifetime, modern day interpretations place him as one of the most influential Post-Impressionists. Monet's influence is closely noted in van Gogh's work and the artist was known to have revered Monet's oeuvre. In his short life van Gogh spent years in Paris, where his exposure to the Impressionists clearly exerted an influence on his artwork. Although van Gogh's subject was noticeably different to the Impressionists, his style of brush stroke bears remarkable similarities. As an artist who was a renowned part of the Paris Impressionist movement in the 1870s, Renoir made a name for himself as a painter who attempted as much as possible to depict the beauty in life. Renoir once famousy said, "Why shouldn't art be pretty? There are enough unpleasant things in the world". 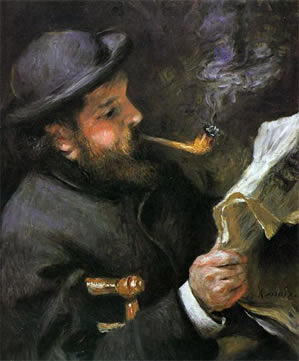 Renoir often painted beside his friend Claude Monet and the two were said to have often shared ideas and styles with regards to Impressionism. Like many Impressionist painters, Claude Monet received a great deal of harsh criticism for his vibrantly bold artistic movement. Monet and his peers were deridingly known as Impressionists, because there work seemed rushed and unfinished. At its inception critics didn't quite understand that the concentration of Impressionism wasn't the traditional detailed view of peoples and places that had previously marked such works. Amongst Monet's modern day critical reception many essayists and critics believe that there was more incentive behind his Impressionist style than merely the artistic ideals. Additionally, some critics are dubious of Monet's artistic integrity with regards to his money making endeavors, of which he was greatly successful. Due to their rapid brush strokes many, upon viewing their first Impressionist painting thought of them as unfinished. It led to French art critic Louis Leroy labeling them "Impressionist" as an insult, but the circle of artists famously used the name to label the movement. Like Realist painters before them the Impressionists struggled to show their work at exhibitions and galleries. Monet led the way in appealing directly to the viewing public by organizing his own exhibition. Such exile from the artistic mainstream began to fade away as Impressionism became more and more accepted and revered art form. Virginia Spate believes that Monet's turn to series painting may have been influenced by France's desire to compete as a major force in the art world once more. 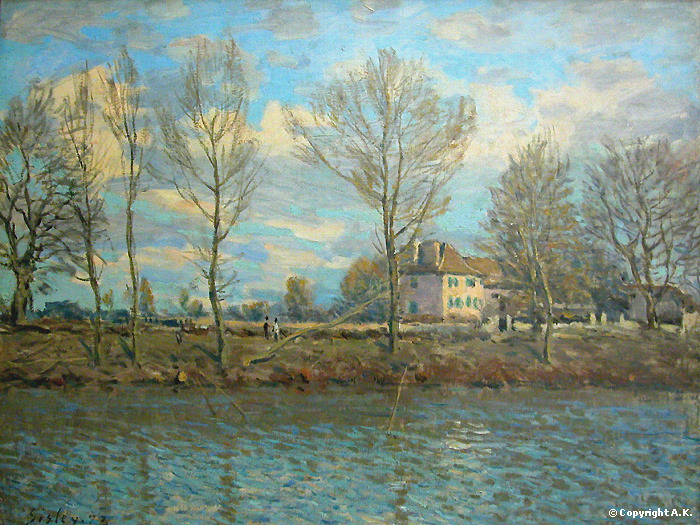 Spate's criticism is also leveled at Monet's dishonesty in regards the style of his paintings. His outdoor painting style, she notes, was clearly embellished by the artist, as he would often finish such works indoors. 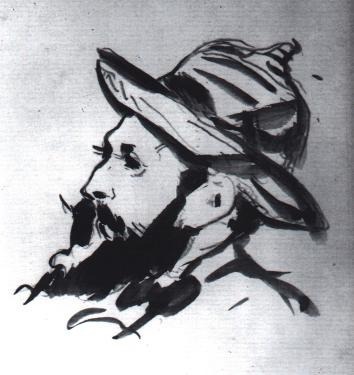 She cites about his work that: "By 1880 he had quite evidently begun to elaborate and finish many of them at his leisure, away from the motif and 'in the studio' - a method incompatible with the classic Impressionist dogma of instantaneity" and that "Monet's projected press image was somewhat dishonest". Spate's criticism goes further in suggesting that Monet's sole purpose towards the latter half of his career was wealth driven and that many of his pieces were specifically marketed and "designed for speculation". To read more about Claude Monet and his artworks please choose from the following recommended sources.